The 12" LP is out of print. However, these songs are available on CD and as Digital MP3s. 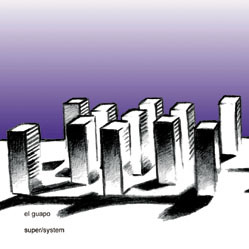 In March 2001, El Guapo recorded their debut album for Dischord Records, "super/system," with Phil Manley of Trans Am at National Recording Studio. The 18-song, 42-minute final edit -- hailed by People Magazine as the "Pet Sounds" of Washington, D.C. postpunk -- is a testament to the band's multi-instrumental versatility and innovative approach to music making. 13. Disappointment Spelled With "V"